My dear wife and I don’t often disagree. Thankfully. When she does get going, it’s hell on earth for about 5 minutes. So I do what I can to avoid the minor infractions of the peace and calm that generally permeates the shack. Anything for a peaceful life. So it was with some trepidation that I learned, to my absolute horror, that my pipe cabinets weren’t really cutting the mustard any more, as they couldn’t really hold all my pipes and the dear one was a little miffed at them. Well, I could see the cabinets on the wall, how could I possibly have missed the writing? Something had to be done and now. My pipe collection was beginning to go into overflow. 75 pipes do fill a fair amount of table and shelf space. Frankly, my dear wife had a point. My first idea was to build some sort of panel arrangement much like those one sees in the best tobacconists, displaying their pipes. They are functional, but large. Cabinets were out of the question. They would have to resemble free standing wardrobes. Eventually, after some discussion with Her Majesty, we decided a shelf system would hold my scotch collection, including decanters and glasses, tobacco jars, pipe cleaners, ash try and all the other gentleman’s acoutrements that follow me around and something similar would bear my pipes. I had then, what some might call, a revelation. Pipe rails! If I could manufacture some kind of wooden rail, fix it to the wall and then have my briars hanging in pipe holders, I might have a very nice display and some semblance of order in my scattered treasures. Brilliant! Easy! I would start immediately. The hunt for materials was on. I contacted the largest pipe making factory in Denmark. Stanwell. They have the clips but I had to get the permission to buy them from Nordic Tobacco Company. I rang them. No problem. Ring back to Stanwell, drop the necessary name and bingo! 50 clips please. I already had about 25, gathered from a friend in my pipe club, so now I have 75. Off then, to the builders merchants. I found the very things I needed there. Wooden rails, wood stain, screws and so on. Luckily, I have all the tools I need already, so no further expense there. Home again and get stuck in. I measured the wall. I measured the wood. I calculated how to hang 25 pipes on a rail, spaced at 50 mm. I cut the wood to length. I painted it. I bored 25 pilot holes in each rail. I screwed 25 pipe clips to each rail. Job done, I grabbed a beer, filled a pipe and went back into planning mode, which is usually a dangerous affair at the best of times. Well, it would have been job done, and my planning was leading me in the right direction. But where the old cabinets had hung on the wall, the paint beneath them was like new. Not so for the rest of the wall. Obviously, I had to repaint the wall. Not just that wall of course. No. The whole living room needs a repaint now. My “to do” list just got longer again. Ho-hum. I have a sneaking suspicion, that this was my dear lady’s intent right from the get-go, but that is merely conjecture and a good deal of paranoia. At least, according to her, it is! Undaunted by this tragic misfortune and gross miscalculation, I painted two walls and proceeded to hang my pipe rails up. Drill in hand and armed with rawl plugs, screws, screwdriver and aforementioned rails, I diligently got to work. Actually, it was easy. Putting the first screw in place and then using a spirit level to get everything horizontal and vertical, the work was over in no time. All I needed to do was gather my pipes and put them in place. Not all my pipes will be on the wall. I have a few very expensive meerschaums and briars that live in their original boxes. I’ll need an alternative plan for them. I’ll develop that as I repaint the rest of the living room. 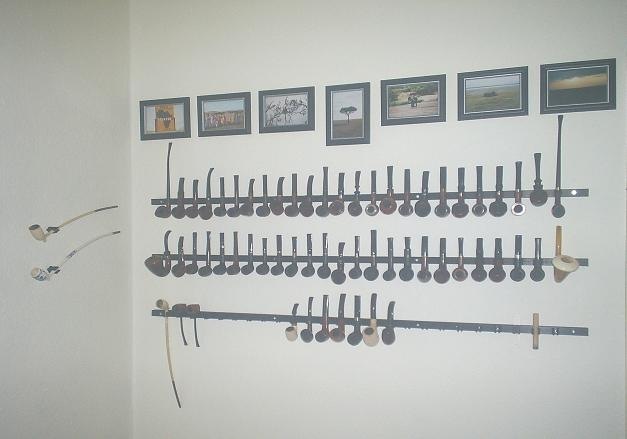 To finish the whole thing off, my dearly beloved suggested I hang a few of my pictures from Africa, taken on safari a couple of years back, over the pipes to set the whole thing off. Good idea. I did that. The conversational value of this corner of our living room just went up by hundreds of percent. The next phase is to get some shelving to house my whisky collection and then mount those on the wall under the rails. That part will have to wait for a few days yet until we can get to the furniture store. But it’s looking good. So far. In fact, I’m ecstatic! Once I get my scotch in place, I’m moving into the corner for good!